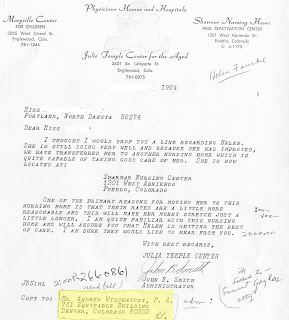 a3Genealogy: The Public Administrator Did It! The Public Administrator Did It! 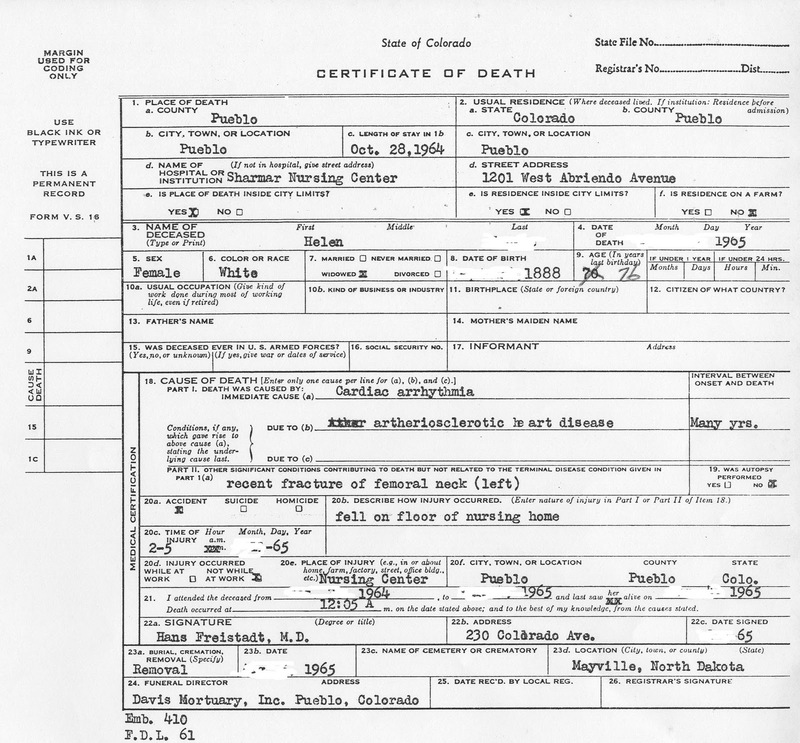 A letter tucked in funeral records gave me the clue that Helen died incapable of handling her own affairs. Her death certificate from the Nursing Home shared that she had fallen and broken her hip, but this does not usually require a Public Administrator to manage one's financial affairs. It is important for family researchers to understand the role of those who legally assisted our ancestors in order to prevent valuable clues to go unnoticed, since this seemingly small hint may be the window to opening or closing our ancestor's life story. Thank you for your request. Due to the case type, we are not allowed to release information on cases regarding mental health issues. In addition, we cannot verify if we had a case matching a name either. These cases are sealed and protected from the public. Hint: Once you mention that your ancestor's court records were due to mental incompetence, you may not get a lot of help from the Court staff in a closed state. Know the laws of the state. So besides tracking down the archived court records, it will behoove any researcher to have a basic understanding of the state's rules and implementations of such jobs as public administer, conservator, and guardianship. This will guide the researcher on "next steps." Keep in mind that the laws of each state are uniquely implemented, but as I have mentioned before, signatures of letters/correspondence carry a lot of weight. In this case it implied Helen was mentally incompetent to manage her own healthy pension $2500.00/month by 1965. She had worked for Standard Oil Vacuum in China from 1919-1938. And disappeared from the radar from 1939 to her death in 1965. Public Administrators, appointed by the court, may be responsible for decisions regarding medical consents, educational/habilitation plans, finances and general health of those entrusted to the office of the Probate Court. The Probate Court may also appoint a Public Administrator as to represent deceased estates. Fees for the Public Administrator's services are paid by the ward's estate in accordance state's statute. Two important responsibilities of the Public Administrator are Guardianship and Conservatorship. Guardianship refers to monitoring the physical well being of a ward and conservatorship refers to the financial administration of the ward's assets. The Public Administrator must report annually to the Probate Court on the financial and physical well being of each ward (person). Remember guardianship may apply to adults (elder care) or child. Again, know your state's rule. Conservator. The conservator is a court appointed "custodian of property." It often has restricted power of duties. 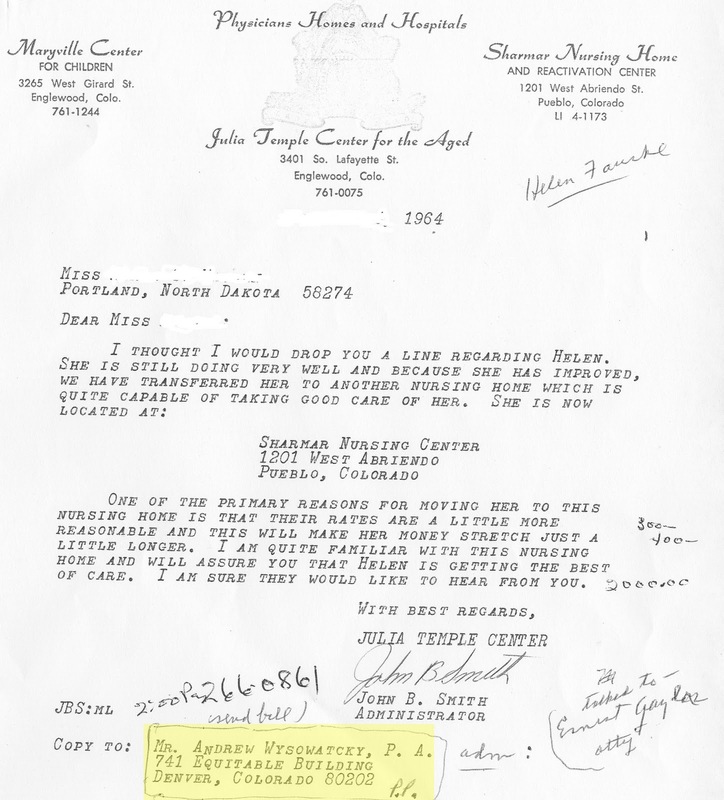 Conservatorship records are often closed since it may indicate that your ancestor was "unable to effectively receive and evaluate information or make or communicate decisions to such an extent that the individual lacks the ability to satisfy essential requirements for physical health, safety, or self-care, even with appropriate and reasonably available technological assistance.” In other words, mentally incompetent. Fees are paid from the "ward or subject's" finances. In this case Helen's pension, paid for her conservator fees. Hint: If your ancestor fell under the protection of the Public Administrator, you may also want to check "Small Estates as well as Probate. Records." A letter from the court explained that information on the ward would not be released, nor would they admit or deny "if the records exists. " So what is a researcher to do? Work backwards from death. 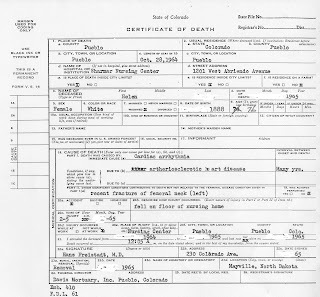 Beginning with the last known residence, a Nursing Home that was identified on the death certificate, records were found from various sources to illuminate the last part of Helen's life story. The funeral home, held additional information, and the Public Administrator's office held additional information. An unpopular record, Helen's employment pension, also held vital information to piece together her years of confinement. Be sure to check for Sheriff and Public Administrator Record books of the county. Remember these records may not be held with the other Probate and Estate records, so don't forget to gently inquire.